2018 elections: What drove Montana’s record-breaking voter turnout? (Montana Free Press) Montana saw high voter participation in the 2018 midterm elections, even for an election noteworthy for remarkable turnout nationwide. In terms of turnout by registered voters, Montana creamed most Western states, with a turnout rate of 71.5 percent. 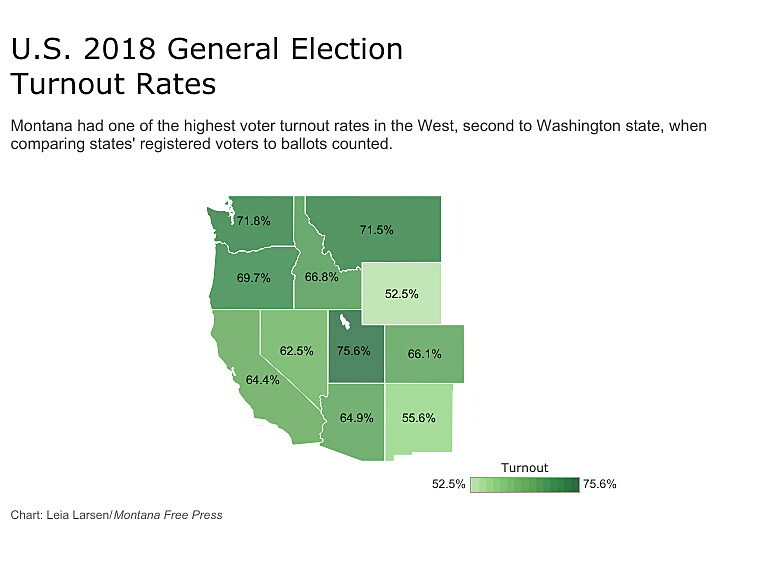 Only Washington state and Utah had higher turnout in the West. It’s the highest turnout of registered Montana voters since 1990, according to data compiled on the Montana Secretary of State website. Election experts point to a few key motivators that drove Montana voters to the polls. Chief among those was a hotly contested Senate race between incumbent Jon Tester, a Democrat, and Republican challenger Matt Rosendale that spurred four separate campaign visits from President Donald Trump and additional visits from other high-profile Republicans, including Vice President Mike Pence. “Tester was widely seen as vulnerable, and for good reason,” said University of Montana political science professor Robert Saldin. The two-term incumbent senator was a target after winning his past two elections with narrow margins, Saldin said. Tester also became a Trump target after stirring up concerns about the president’s pick to head the Department of Veterans Affairs, Ronny Jackson. Last spring, Trump said Tester would have a “big price to pay in Montana” after Jackson withdrew his nomination. “It was clear from the beginning this was going to be a close election,” Saldin said. The confirmation hearings for Supreme Court Justice Brett Kavanaugh may have helped mobilize Republicans, as well, Saldin said. “So just at a national level, you have everyone mobilized at a higher level than you typically see during a midterm,” he said. A close House race between Republican U.S. Rep. Greg Gianforte and Democrat Kathleen Williams upped the ante. Two high-profile ballot measures — one to increase the tobacco tax to help fund Medicaid expansion, and one that would restrict new hard-rock mining permits — may also have driven nonpartisan turnout. 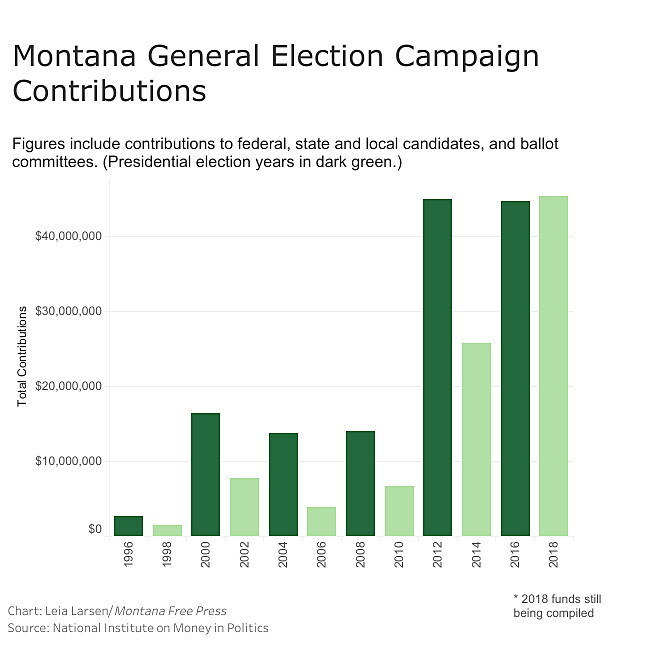 In all, just under $45.4 million was contributed to the state’s candidates and committees in 2018, according to the most recent data from the National Institute on Money in Politics. That’s more campaign funds than flowed through Montana in the 2016 presidential election. “All of that bundled together, I think, lent this midterm election the feeling and energy that we typically only see in presidential years,” Saldin said. Michael P. McDonald, a political scientist at the University of Florida, said there’s slightly more to Montana’s high voter-turnout, which mirrored national trends. McDonald has compiled data on the nation’s voting-eligible population since 2000 for the United States Elections Project. Calculating the voting-eligible population means adjusting the number of voting-age people living in the U.S. by subtracting ineligible felons and non-citizens. Most states, including Montana, base turnout calculations on registered voters. But the voting-eligible calculation provides a clearer picture of turnout trends across states, McDonald said. Accounting for voting-eligible populations, Montana had a 2018 turnout rate of 62 percent — the third-highest turnout rate in the nation. The U.S. average was 50.1 percent. Treasure State voters showed up in higher percentages even compared to states such as Arizona and Texas, which also saw high-profile, competitive U.S. Senate races and big money. McDonald said that turnout difference lies in demographics. Arizona and Texas have bigger Latino populations than Montana. “We know that Latinx [and] Hispanics tend to vote at much lower rates than other groups in the population,” he said. Montana’s population is whiter and tends to be better-educated than some states farther south, which often correlates to higher voter turnout. It’s a trend McDonald sees in many northern states. “If you look across the upper tier of the U.S., they all have higher turnout rates. It’s not just Montana,” he said. Another big factor in turnout, McDonald said, is voter registration policy. Montana is one of 15 states plus the District of Columbia that allow voters to register until the close of polls on Election Day. “Registration deadlines are one of the larger impediments to higher turnout,” McDonald said. Numerous studies, compiled by the National Conference of State Legislatures, have found voter participation is 4 to 7 percent higher in states that allow same-day registration. 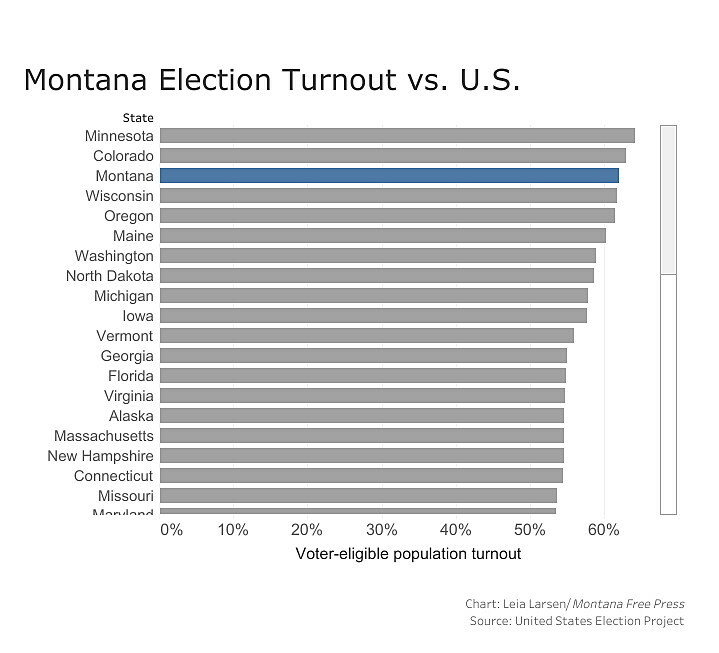 While Montana’s 2018 midterm turnout was higher than other midterm years since 1990, bigger turnout was a trend seen nationwide this election. The 50.1 percent national turnout hasn’t been seen in a midterm since 1914, when 50.4 percent of eligible U.S. voters cast ballots. Given that Trump wasn’t even on the ballot in 2018, McDonald said, 2020 will likely be an interesting year. Contact Leia Larsen at llarsen@mtfp.orgor (406) 465-3386. This story originally appeared online at Montana Free Press.